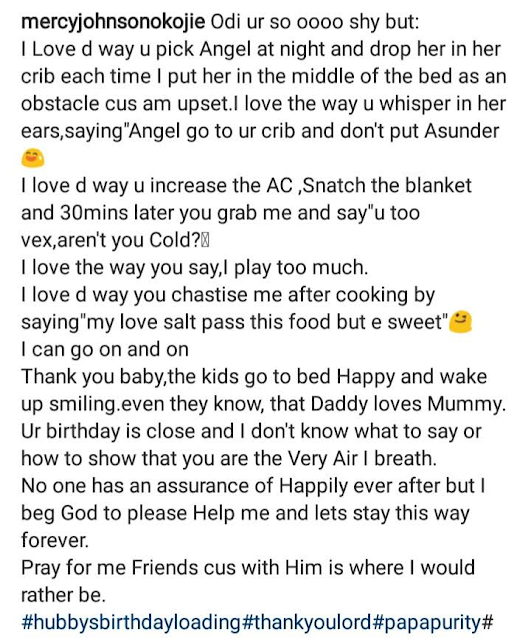 Nollywood screen diva, Mercy Johnson, whose love for husband has been shown in diverse ways, has taken to Instagram to give her husband, Prince Okojie, a birthday shoutout. Though his birthday is on May 15th, Mercy also shared a video with her husband with the hashtag #hubbysbirthdayloading. I love the way you say,I play too much. Thank you baby,the kids go to bed Happy and wake up smiling.even they know, that Daddy loves Mummy. Ur birthday is close and I don't know what to say or how to show that you are the Very Air I breath. No one has an assurance of Happily ever after but I beg God to please Help me and lets stay this way forever. Pray for me Friends cus with Him is where I would rather be.